A retaining wall is a structure exposed to lateral pressures from the retained soil plus any other surcharges and external loads. When the wall is founded on soil, all overall stability failure modes need to be checked. But what about when the wall is supported on piles? 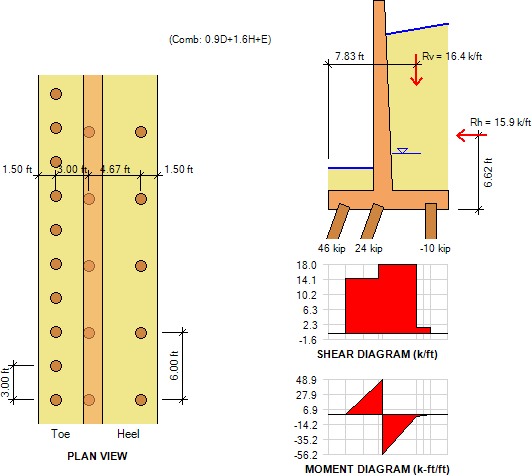 This article discusses the design steps in the design of retaining walls supported on piles. Our software ASDIP RETAIN will be used to support the discussion. What are the loads transferred to the foundation? In addition to the retained backfill, retaining walls may be subject to surcharge loads at the top of retained mass. The stem may also have concentrated loads at the top. When the stem extends above backfill the retaining wall may be exposed to wind load. When retaining walls are located in seismic zones the seismic effects should considered. The horizontal pressures on the backfill side will produce an overturning moment with respect to the base of the footing. The backfill pressure will produce also a horizontal sliding force on the wall. In addition, all vertical forces, including the wall selfweight and the weight of the backfill over the heel must be considered. At the end of the analysis process, three resultant forces at the base of the footing will be calculated: the overturning moment, the vertical resultant, and the horizontal resultant, as shown in the picture below. How do you check the overall stability? Pile foundations provide the wall stability directly by the forces taken by the piles. Unlike walls founded on soil, which transfer compression-only forces to the foundation, piles usually have a tension capacity. Therefore the applied overturning moment can be resisted by a couple of forces on the piles, one in tension and one in compression. Likewise, the applied sliding force will be resisted by the lateral capacity of the vertical piles. When more lateral capacity is required, some piles may be battered so that the horizontal component of the axial load can be used to resist the sliding force. Unlike walls on soil, the bearing capacity of the pile foundation can be increased by adding more piles, either vertical or batter, per the soils report recommendations. The number and location of piles is very important to calculate the pile forces. Each pile axial load must be smaller than the axial capacity, and the sliding force must be smaller than the horizontal capacity of the pile group. As an example, the picture below shows the ASDIP RETAIN pile calculations. Note that the controlling load combination is based on service loads. How do you design the pile cap? The pile cap is the concrete element that transfers the loads to the supporting piles. ASDIP RETAIN calculates the shear and moment diagrams based on the factored pile reactions and the applied loads. With this information the main reinforcement is then designed at top and bottom of the pile cap. In the direction parallel to the wall, the pile cap acts as a continuous beam supported by the piles. ASDIP RETAIN calculates the moments based on the pile reactions and assuming a uniformly distributed load. The pile cap must also be checked for punching shear around the piles, and for one-way shear along the wall. The picture below shows the retaining wall in plan and elevation views showing the pile cap diagrams generated by ASDIP RETAIN. ASDIP RETAIN includes the design of retaining walls supported on piles. The number and location of the piles are very important to calculate the pile forces. The pile cap must be designed for the resulting shears and moments in both directions. When designed by hand the whole process may be time consuming. For a more in-depth discussion of the theories and overall stability modes please read my post Cantilever Retaining Walls: An Overview of the Design Process (Part 1).